Welcome to Nye County, Nevada, where America's great entrepreneurial spirit drives a positive attitude toward new endeavors and opportunities. Our diverse economy includes mining, agriculture, recreation, and an influential public sector. Now, Nye County moves forward to establish robust renewable power production clusters. The National Renewable Energy Lab (NREL) recognizes Nye County for its superb solar resource. Abundant wind, geothermal, and biomass resources complete the County's renewable resource portfolio. Founded by hardy, independent-minded individuals, Nye County remains light on regulations and taxes and rich in development opportunities. Here, you will find freedom from corporate tax, personal income tax, franchise tax, and inventory tax. In addition, our property and sales taxes remain low. We offer a voluntary development agreement designed to reduce development uncertainties. Establishing a relationship with County government will help to facilitate stakeholder interactions and the identification and possible implementation of mitigation opportunities early in the project. 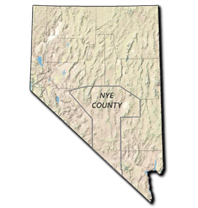 Whatever the size of your project, you will find Nye County to be a reasonable, friendly place to do business. An information packet has been prepared to assist in development of renewable resource projects. Experienced professionals, familiar with the industry and the County, are prepared to answer your questions. If you are interested in obtaining a free information packet, or learning more about how to develop renewable energy projects in Nye County, Nevada, please contact us.